We purchased a bottle, and have been holding on to it for a special occasion. It turns out that some friends of ours had a couple of bottles of Austin Hope wines sitting at home as well, so we decided to have our own private tasting – along with a good meal, of course. Candor Zinfandel – M- Here’s the party animal. Full mouth of flavor, but not sloppy. Great full-bodied chunk with a bold class in the glass. 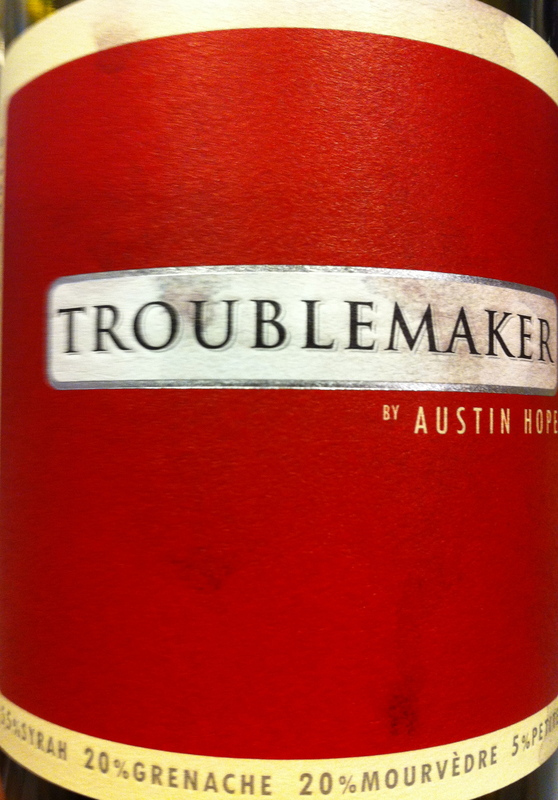 Troublemaker Blend – M- As the name sounds, this guy is bold and crafty. A great full-bodied, trickster of multiple layers of mischief. Great contrast to the grenache, and a definite relative to the Austin Hope. Balanced, yet a different shade, real different shade of grape. 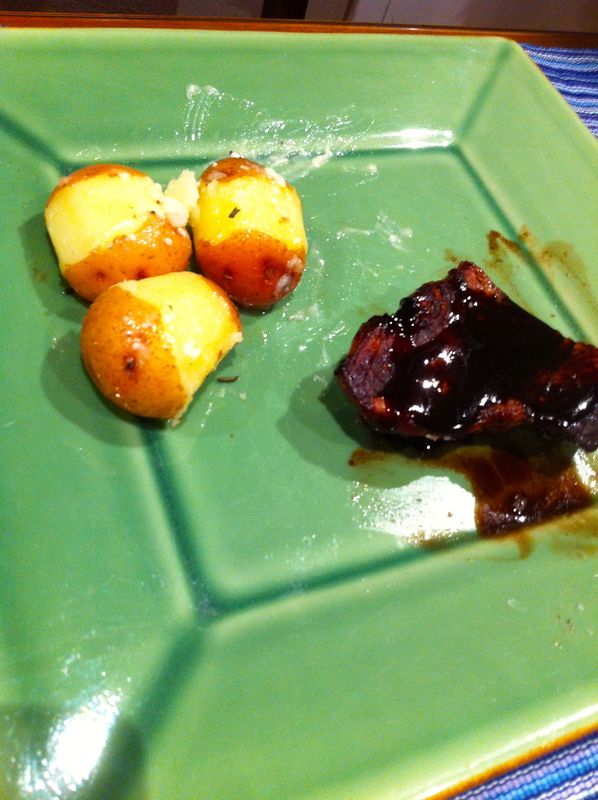 Our first tasting task was to decide on which wine would be used for the Bordelaise sauce mentioned below. We had no expert idea on how to choose. 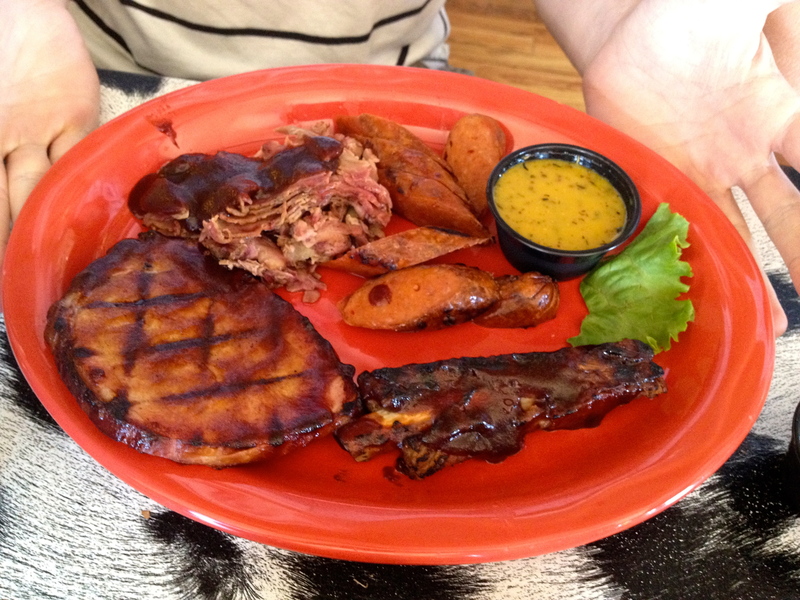 So, we decided to pick the most complex or full flavor with interesting qualities we felt would hold up in the sauce. We chose the Zin, Candor. The blue cheese butter was another “first time” offer and even easier – just took a some salted butter, softened it a little, then used a fork to mix it with some blue cheese ( My ratio was 3:1, but the verdict was that more blue cheese would have been fine, so next time I think I’ll go for 2:1). Tasting Results- What we discovered is that these three reds each brought their “A-Game” to the table. Each had been lying down for over a year, and opened up in a slow seduction to our taste buds. Each, by itself, evolved into a beautiful portrait of flavor, changing as the night went on, dancing a different step with each part of each course. And, making it through the entire evening, lasting with style and panache. I couldn’t tell you which one went better with which course. They were all good. Each went beautifully with the grilled meat and sauce. 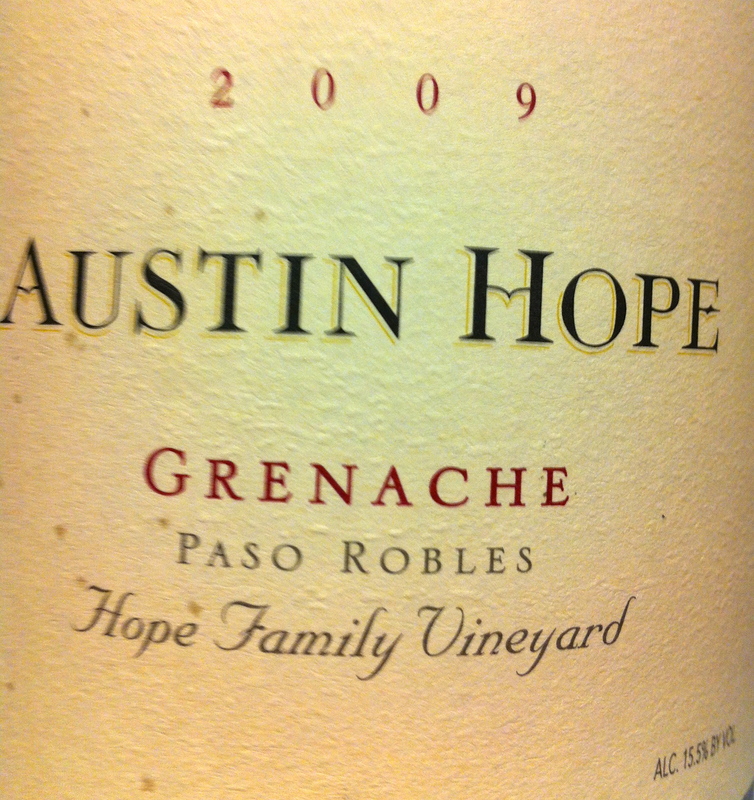 Result– Austin Hope Wines are fantastic. Wonderful dance partners on the table, if you will. And we are lucky to have been invited. 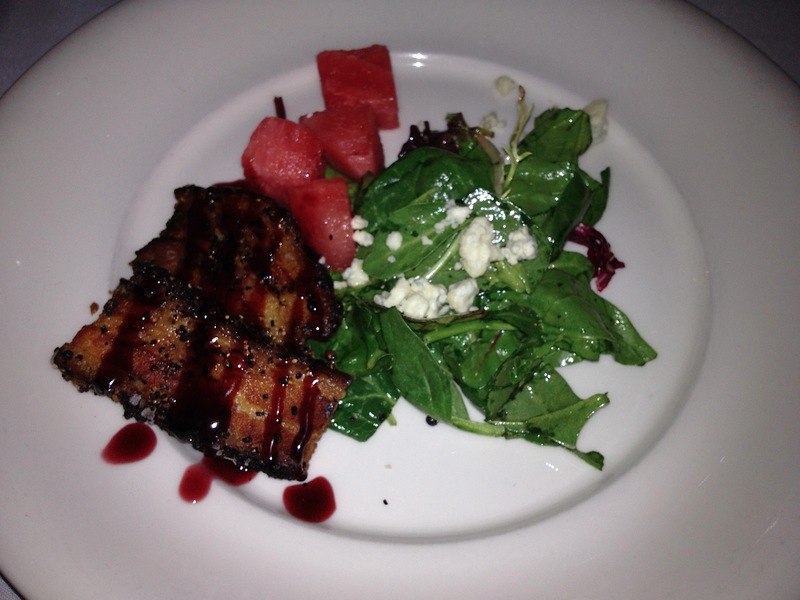 We look forward to more intimate and delicious evenings like this one. Anyone have a recommended trio of wines that would make for a great wine tasting dinner? D – As I was doing a little “De-Clutter 101” around the house, I paused in front of my bookshelf of cookbooks a little too long. Giada’s Kitchen jumped out at me and said “Make something delicious for dinner tonight!” Two nights later, we have discovered two fabulous, new entrees that will be definitely joining the rotation of family favorites. No, I did not take pictures (sorry). Perhaps next time they grace our table. 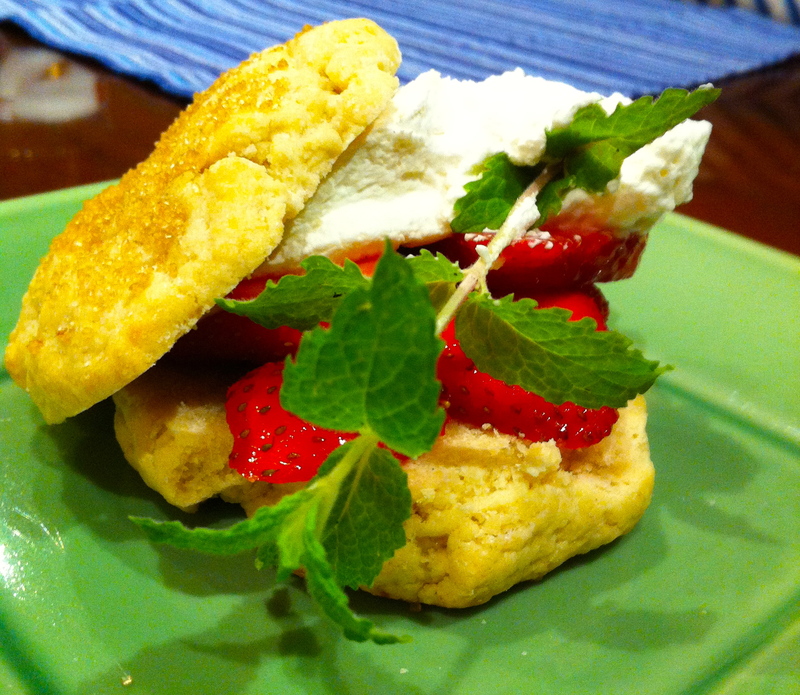 Here are the links, however, to the recipes online at FOOD NETWORK. Balsamic BBQ Chicken – super easy! Sauce would be delicious with pork or beef as well. Served with a salad and new potatoes (with a blue cheese butter – see the Austin Hope Wine entry for more details). Prosciutto Lamb Burgers – Another simple recipe. I found ground lamb and prosciutto at the Far West HEB. (the packaged COLUMBUS brand prosciutto actually worked great – they smaller, uniform slices made for easier assembly). 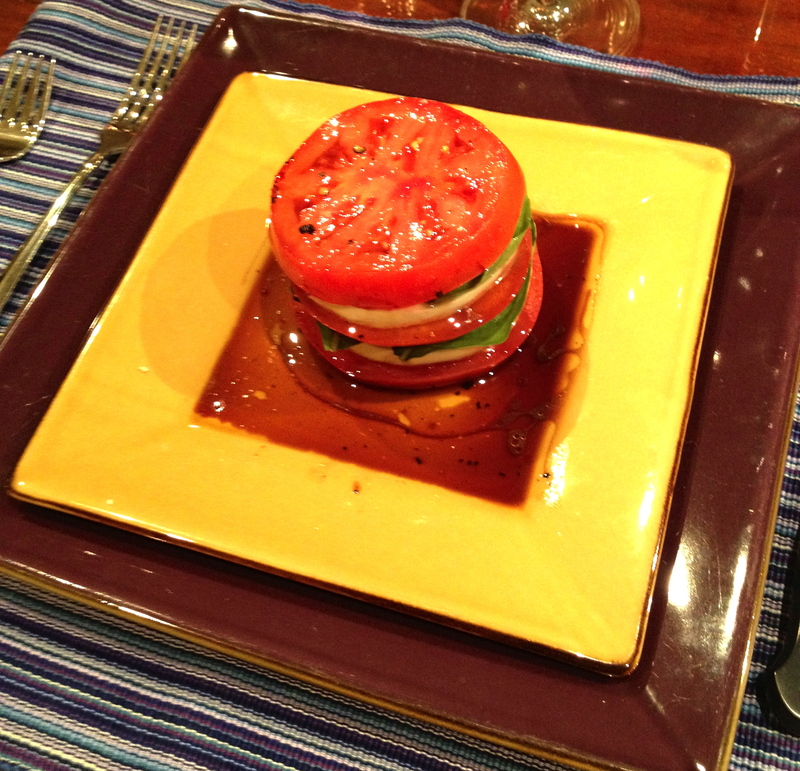 Serving with the slice of fresh tomato and basil is a must! D – Our vacation to Colorado was wonderful, but it is good to be back in Austin. 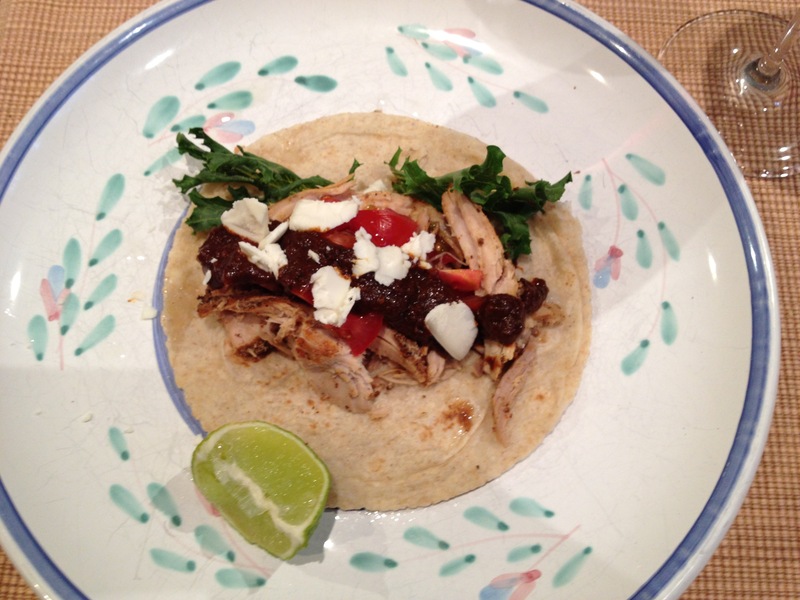 Here is a sampling of our “at home” dining this week. OK, I confess. We did not fix dinner Monday night. We arrived home around 3:00pm, cleaned up, and walked right back out the door to head off to Nick’s SPOTLIGHT ON OPERA concert at Whole Foods. We only had a little over an hour, and the WINK Wine Bar is just minutes from Whole Foods, so we made a pit stop for Happy Hour. Sorry I don’t have a picture, but I can highly recommend the BRIE BURGER SLIDERS with a lovely glass of Riesling. 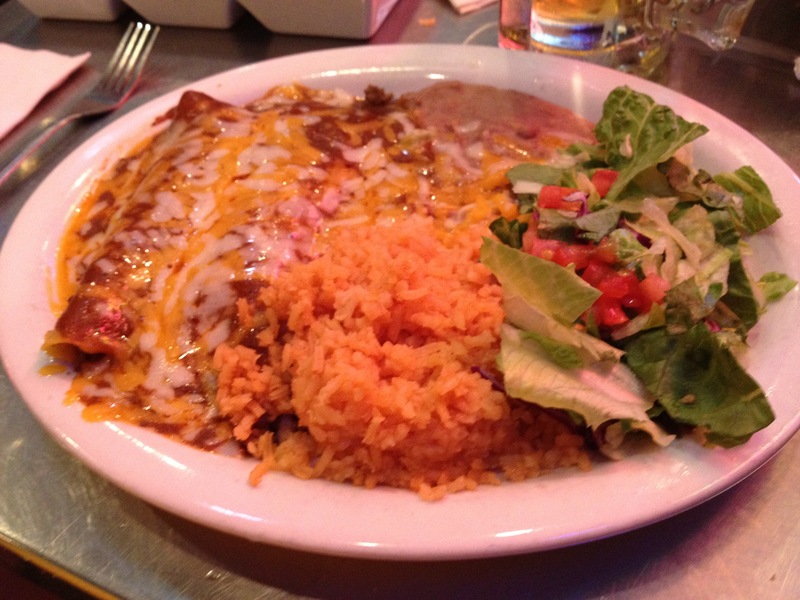 On to Tuesday– Our first official night at home called for a family favorite – the Famous Tamale Casserole. This dish never fails to please the tummy – a delicious combination of cornbread, chicken, red sauce and cheese. Here is the link to the recipe from Cooking Light ( www.myrecipes.com/recipe/chicken-tamale-casserole-10000001854020 ) . The only change we made to the original recipe was to omit the green chilies. Wednesday — I pulled out the crockpot and tossed in a couple of medium sized pieces of boneless pork shoulder with a can of root beer. Seven hours later, I took the pork out of the pot, drained the liquid, shredded the pork, then returned half of it to the pot. I then added BBQ Sauce (Sweet Baby Rays) to the pot. The other half of the pork I seasoned and served with some delectable mole sauce that I had saved in my freezer from our New Year’s Eve dinner. 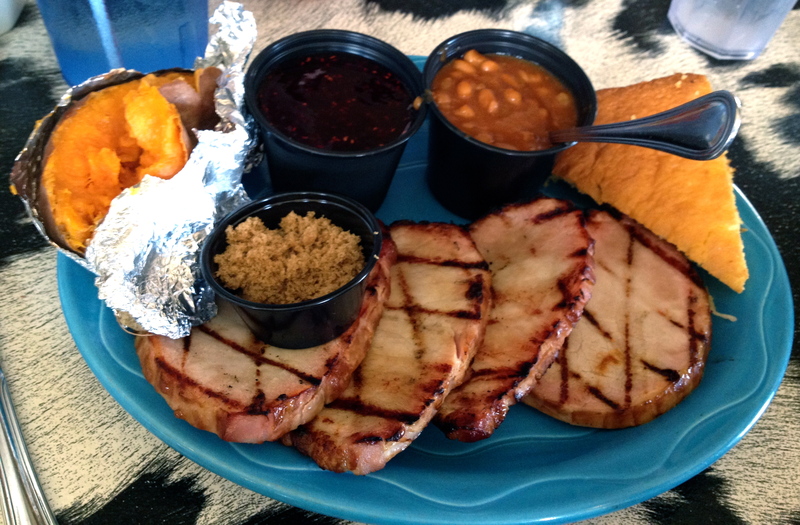 So now we have pork 2-ways! ** Note: A BIG recommendation to try the MISSION brand Artisan Corn and Whole Wheat Blend tortillas. They are available at HEB and complement the pork perfectly. Thursday I made Baked Meatballs with a simple homemade tomato sauce. It was served with a bowl of mixed pasta – trying to use up some of the extra misc. pasta in our pantry. It is so easy to make! I have made it both with/without the fish sauce – didn’t notice much of a difference, so now we make it without, since fish sauce is not an ingredient that I usually stock in my fridge. Just add some extra soy or teriyaki if you need a little more sauce). The red chiles are not always available at HEB, so I just use jalapeno. 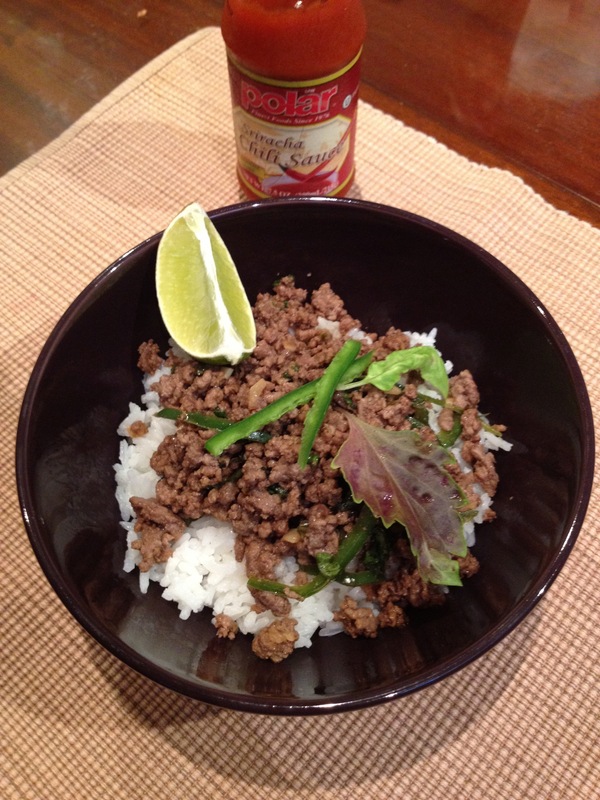 I also serve with Thai red chili sauce. You can add as much heat as you want that way J.
There’s more to come – stay tuned for our Saturday Austin Hope Wine Tasting Dinner!! 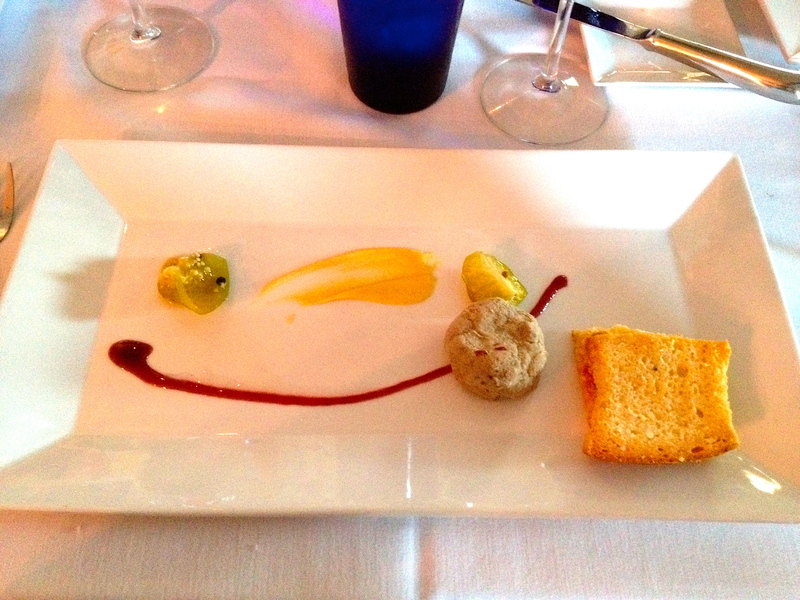 * Excellent service – our waiter was focused and charming. He recommended some excellent wines, both by the glass, and bottle. The food and drink service was seamless – several people quickly and quietly moving around the table to present or collect plates, silverware, fill water glasses, etc. 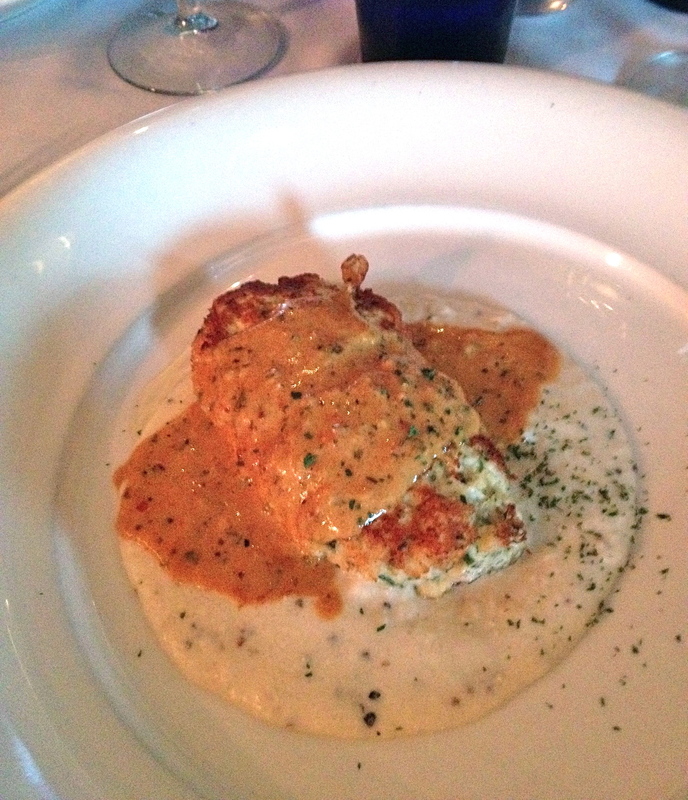 Amazing grits, served under a chicken and rosemary salisbury steak, with a touch of creamed tomato sauce on top – delicious combination of textures and flavors. D – after a refreshing morning hike and afternoon drive in Rocky Mountain National Park, we decided to make a trek to Grand Lake, on the opposite side of the park. After a few stops to view some big horn sheep and Lake Irene, we headed to the Sagebrush BBQ and Grill. We discovered this spot last summer and were excited for a return visit. 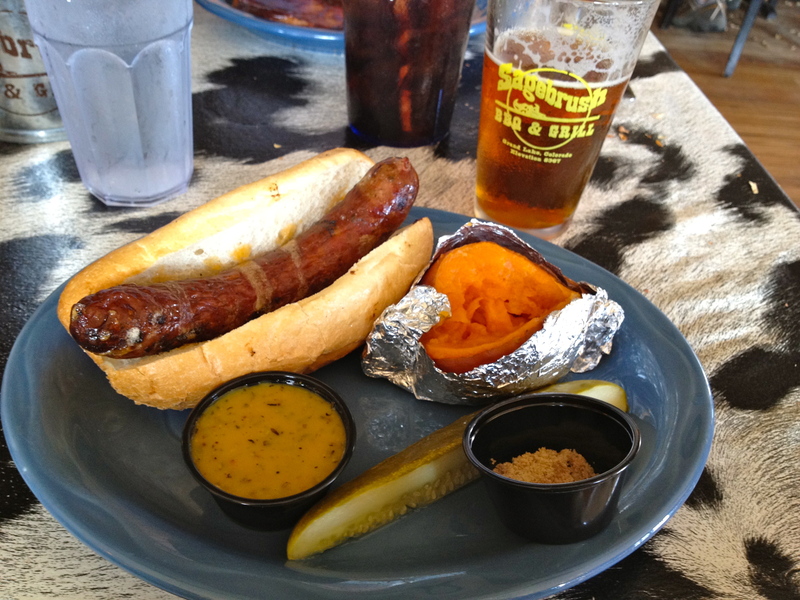 M- The Elk Sausage Hogie—Okay, we did take a few pictures of some beautiful Elk in RMNP, but this sausage was “to die for” (bah dum dum). Thank you, I’m here all week—try the Elk! But try it with this sauce from Heaven- a mustard, rosemary Carolina-style bbq- perfect paring. Speaking of perfect pairing- not wine here, but a pint of Fat Tire. WOW! 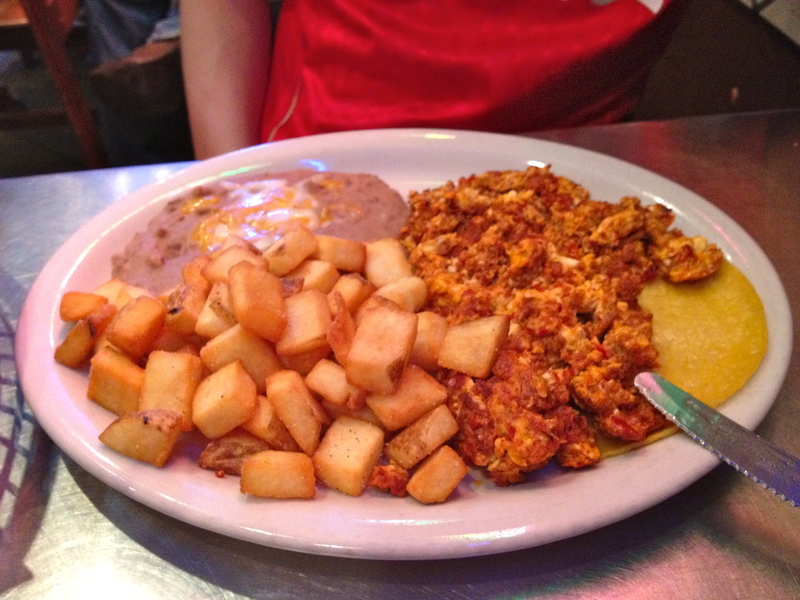 D – We soooo need a SNOOZE in Austin, Texas! 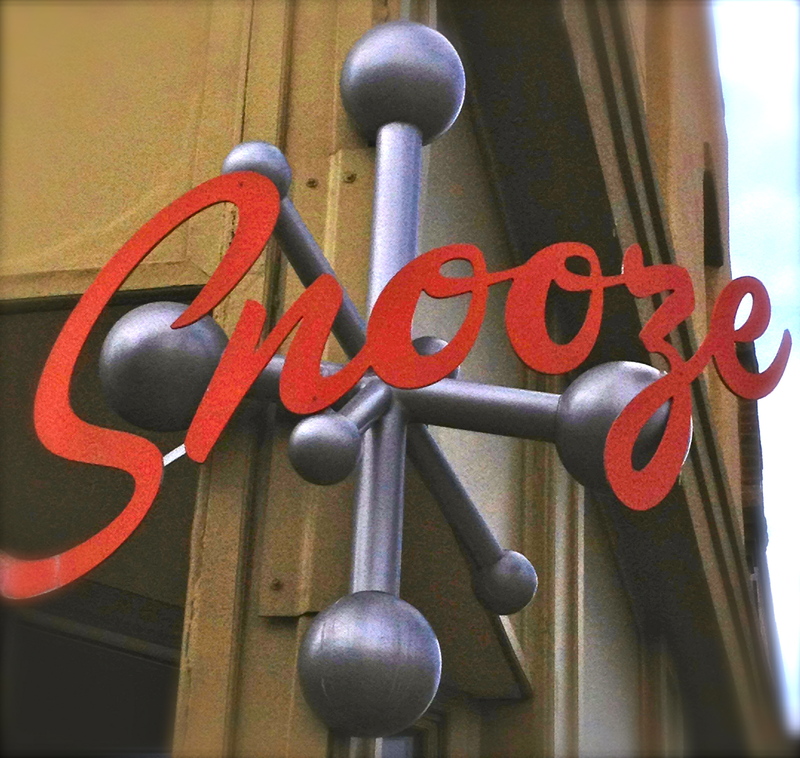 On this, our 4th trip to Colorado, we could not resist a third visit to SNOOZE. Although it was the longest wait for a table (almost two hours, yes, on a Saturday), the food did not disappoint! 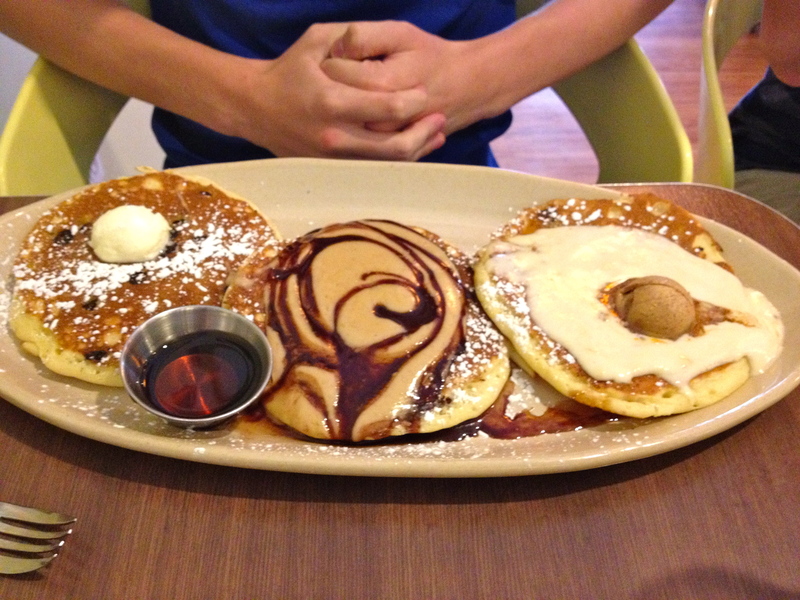 The pancake flight is the way to go – then you get to sample three culinary adventures in one sitting. Pancakes with names like Pineapple-Upside Down, Peanut Butter Cup, Red – Eye Velvet, Sweet Potato, Chocolate Chip and Blueberry Blossom all made it to our table. 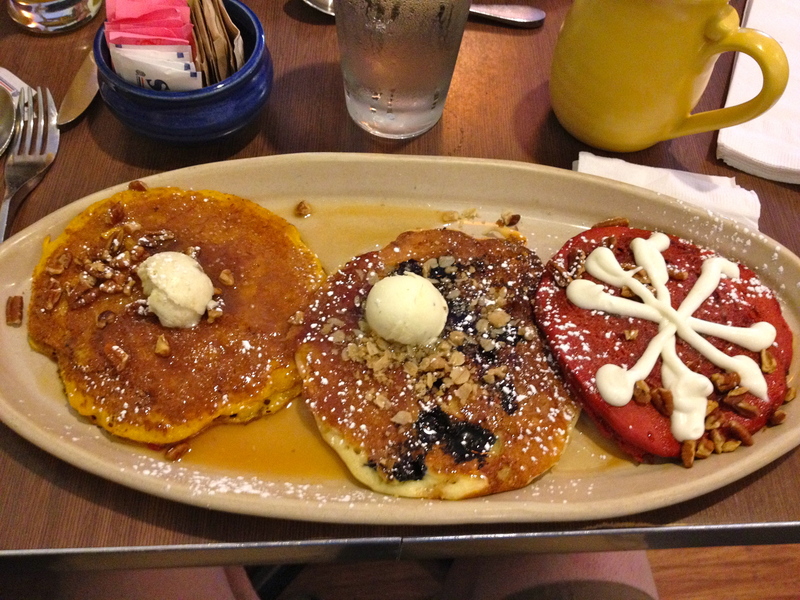 You can go to the Snooze website to read the specifics on the flavor profiles for any pancake on the current menu. ALL of them were delicious – completely devoured. The winner, in my opinion, for this round is the Sweet Potato Pancake (a regular offering on the menu) – a fluffy sweet potato buttermilk pancake with homemade caramel, pecans and ginger butter (the secret weapon). 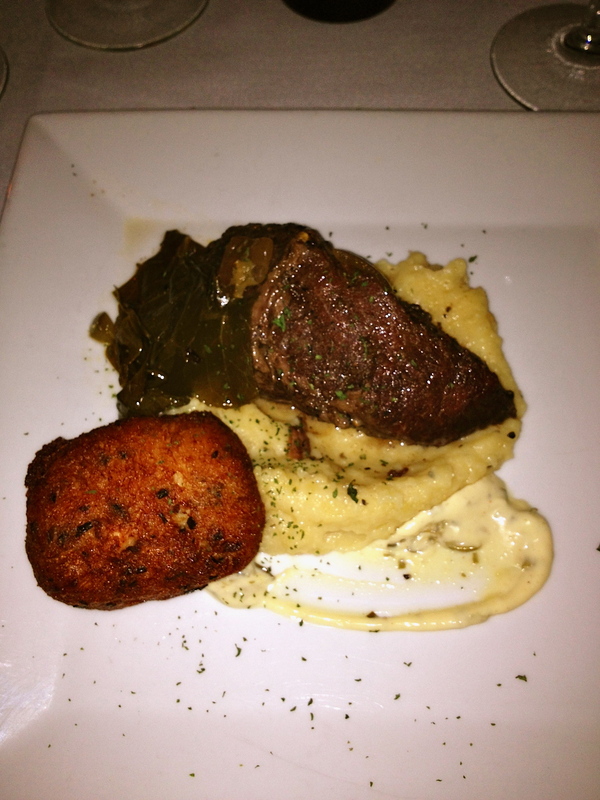 A perfect balance of flavors and textures! 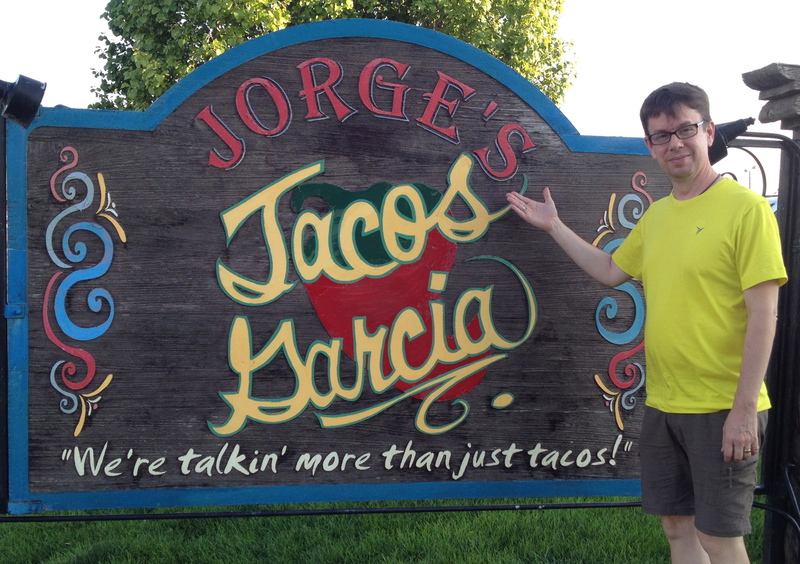 D – Amarillo has been our overnight stop on our treks to Colorado these past three summers, so an evening meal in the “helium capitol of the world” is always a necessity. 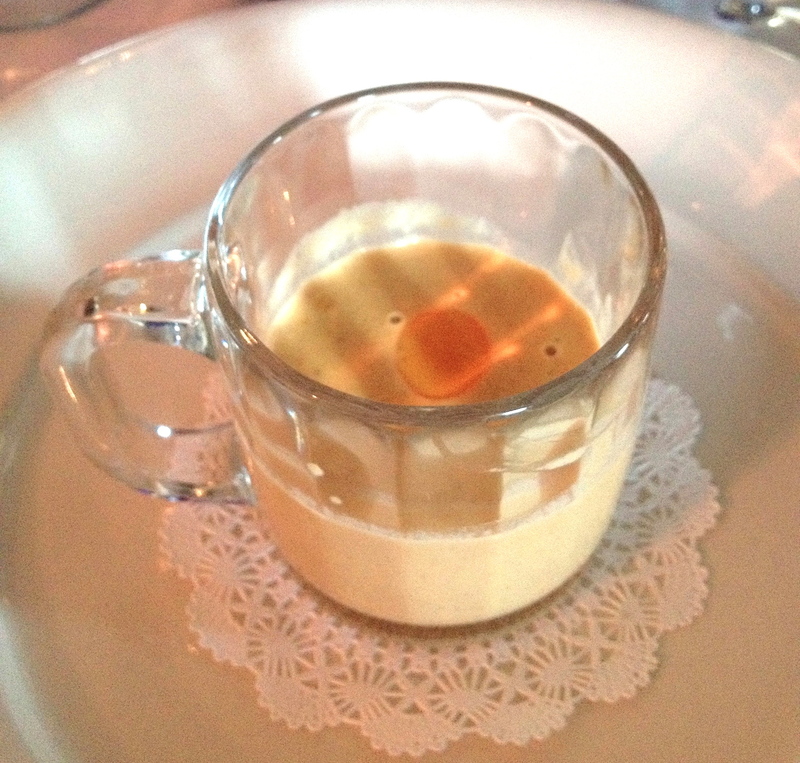 Our previous two dining experiences were “underwhelming.” We really enjoyed our dinner at Jorge’s this time around. 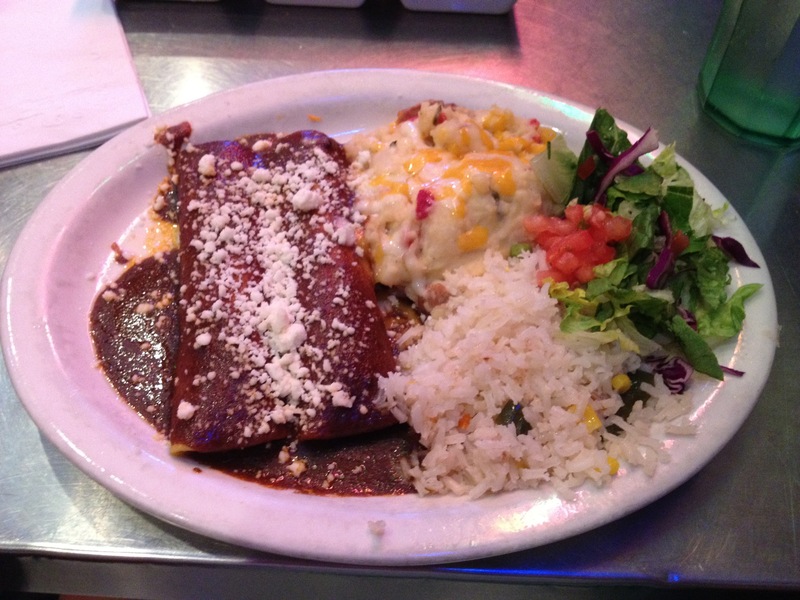 and the “special” – mole chicken enchiladas. * Fresh mozzarella – when I found out that I could buy fresh mozzarella (Lioni) at Antonelli’s Cheese shop for about the same price as the grated bagged stuff from the grocery store, I was sold. If you want to splurge, the Burrata mozzarella is amazing! * Chorizo – Slice up a link of Aurelia’s Chorizo (Made right here in Central Texas), and you will forget you ever enjoyed pepperoni! * Other misc. meats – We like meat on our pizza, and have tried several other meats in combination with the chorizo, including shredded cooked chicken and leftover meatballs. 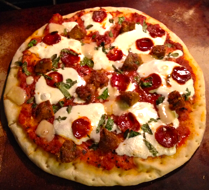 * Fresh herbs – Thanks to my thriving herb garden, I have fresh oregano and basil to sprinkle on top of my pizza. Cilantro is also a great accompaniment for the chorizo. 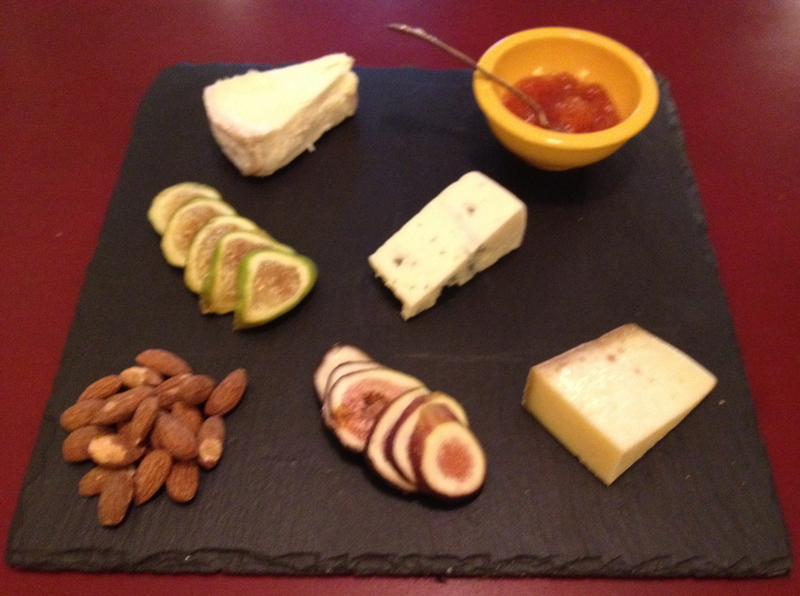 * Cana de Oveja – a soft sheep’s milk cheese from Spain. 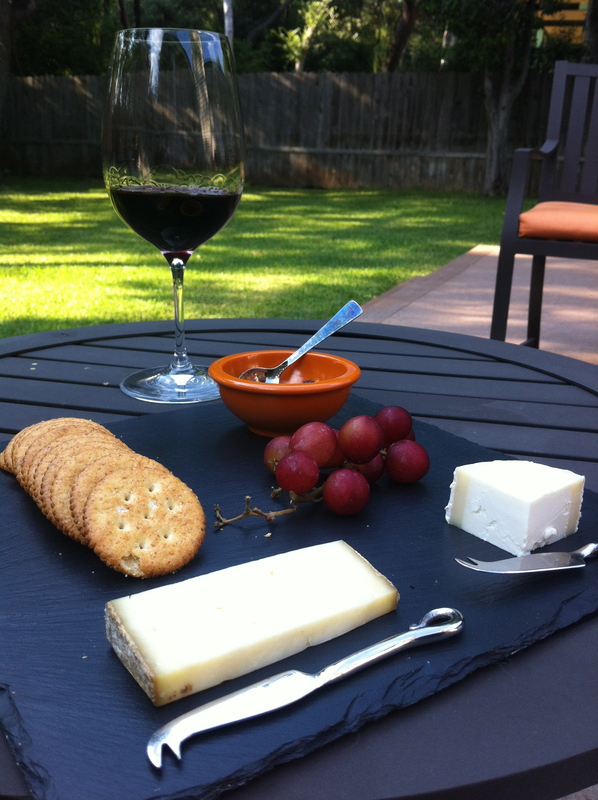 Here is a quick description I found online – “Blanketed with a cottony white mold, the cheese immediately under the rind is ecstatically gooey but gives way to a flakier, crumblier center. With notes of tangy butter”. * Confituras Fig Walnut Preserves (http://confituras.net). Confituras creates locally sourced jams, jellies and preserves in small batches. They are delicious!! Paired beautifully with the Spanish Cana de Oveja. D – Just over a year ago, I started attending regular bootcamp classes at X-TRAIN (http://www.x-trainfit.com) . I could go on and on about the awesome trainers there ( a big SHOUT OUT to Barron and Jeremy) and how they convinced me to keep up with an exercise routine for the first time in my life (better late than never). Along with precise instructions on how to exercise correctly and more efficiently, they also believe in nutrition education and healthy eating habits. Wouldn’t you know? Just a few weeks after making adjustments in our food choices at home, I came across a Groupon for FarmHouse Delivery. 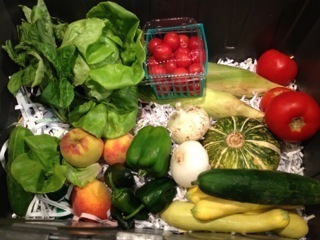 It seemed like a perfect opportunity to challenge our family to eat more fresh produce and to support local farmers. I recommend that you take a look at their website for all the details, but here are the basics of how it works. ALERT! !- This just in! Literally!! Farmhouse Delivery is offering a special offer. New members can get $30 off their first delivery. Promo code: FANDF . So, tonight we will enjoy grilled corn-on-the-cob, caprese salad and a nice fruit salad, including the lovely peaches pictured. QUESTION: In the picture above you will see we received a small (approx. 6” round) winter squash varietal. Besides roasting/baking, does anyone out there have a good recipe for using this veggie in the summer? 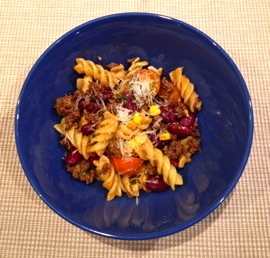 D – Just a quick entry to share a favorite Rachel Ray recipe I found a couple of years ago – SOUTHWESTERN CHILI MAC SALAD. This pasta dish is good warm or cold, and is great for leftovers. I have modified the recipe (link below), by substituting ground bison for the beef. I use whatever onion variety is handy. Thanks to our bi-weekly FarmHouse Delivery (www.farmhousedelivery.com ), we usually have some kind of onions on hand. This week we used spring onions, along with some cherry tomatoes and corn on the cob from our bushel. Besides using the bison, whole wheat pasta can be substituted for a healthier version. To ensure that the bison is flavorful, don’t be shy with the chili powder (I always add extra, along with some comino).